That's a dish I personally love a lot. It's called Krautnudeln in German and I tried it for the first time at my neighbours. This dish comes from the former German Sudeten Territories (for those who aren't common with European history, it's in the Czech Republic now). My neighbour and good friend was a great chef and housewife with great ideas for easy and delicious dishes. I still can't believe that she has passed away in the Summer of 2010. Just chop the cabbage and put it to a pot together with a little bit butter and roast it until the water from the cabbage is gone and the cabbage will get sometimes a little bit brown (roasted). It will take about 20 minutes to get the cabbage roastet. 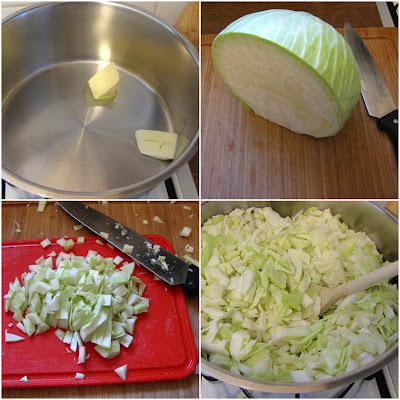 The first 15 minutes the water of the cabbage will flash off, later you will need to agitate the cabbage every 30 seconds not to burn it too much. In the meantime cook the pasta and add it to the roasted cabbage at the end. Add pepper and salt as spices. Serve it with yogurt or some cream. That's all! 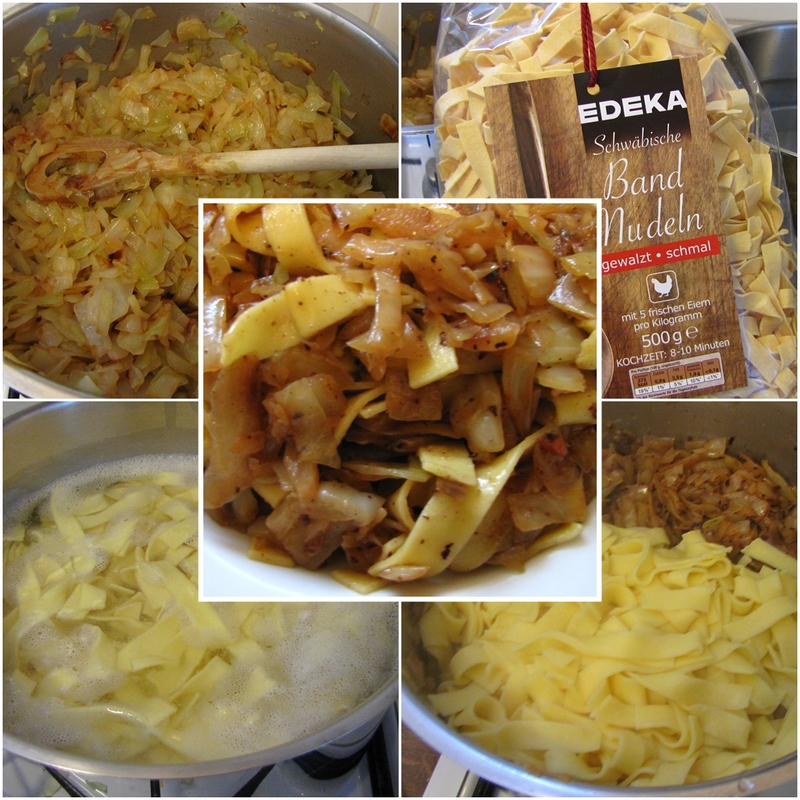 Update 9th October 2012: I made Krautnudeln again. I arrived back in my flat yesterday evening and I had absolutely nothing to eat at home. The first thing I did today morning was going to the supermarket to buy some food. After I saw the cabbage in the vegetables corner I knew what I am cooking today. I'd like to add, that you do not have to worry if the cabbage scorches on the bottom of the pot. That's okay - you will get that roast flavour you need for the Krautnudeln. So it's important to take a pot with a thick bottom (sandwich) or a cast iron one. My heart bled watching my expensive Fissler pot with burned cabbage on its' bottom - but I know that Fissler quality bites it all and it will be no problem to clean it and get it shiny again (You don't know Fissler? That's German quality at its' best. Here's a link to their website). You will need a little bit more salt you probably usual use - but as we say in German, one time is no time. I took Swabian tagliatelle pasta. The pictures of the cooking steps of the latest Krautnudeln are below the old one. 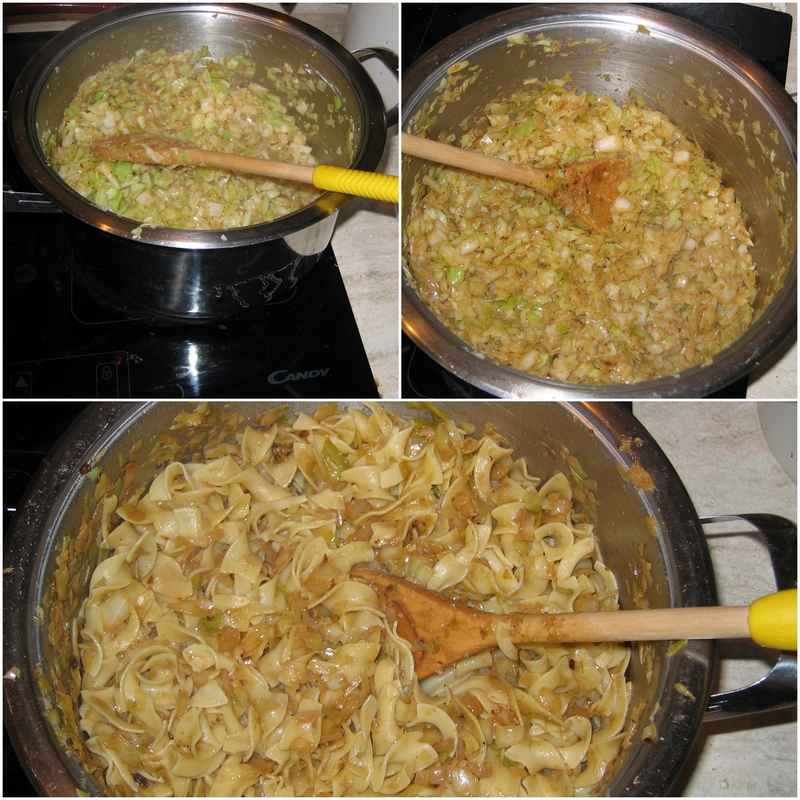 I used only the half of a big cabbage (1,5 kg/ 3 lbs) and a half package of pasta (250 g/ 1/2 lb) and that enough to feed 3-4 people. I will share it today with a friend and still have enough for my lunch tomorrow.